My life changed in so many ways the day my first child was born. Ways I couldn&apos;t possibly imagine. Jenna was the light of my life—happy, healthy, and she had quite the little personality. There wasn&apos;t anything she wouldn&apos;t do for a laugh. Sadly, on January 10, 2003, that all came to a tragic end. While taking a nap at her daycare, Jenna died in her sleep. At the hospital, they were able to resuscitate her, but the following day, she died peacefully in my arms. I was there when she came into this world, and I was there when she left it. It is something no parent should ever experience: the death of their child. Her death was later determined to be Sudden Unexplained Death in Childhood or SUDC. It is something no parent should ever experience: the death of their child. Becoming a mother had such a profound mark on my life, and becoming a mother to a child who died—even greater. In a time when I should have been enjoying the spoils of parenthood, and watching my child learn about the world with excitement, my world was at a standstill. I was stuck in a nightmare, and one that I could not ever get out of. It was through my grief that I found my calling. I always knew that life wasn’t about what you get out of it, it was about what you put into it. And that meant helping others. So as I traveled my grief journey, I joined a group of families like mine, who had lost a child, and through my kinship with them, I began to understand that there were others like me out there. And sadly, there would be more to follow in my footsteps. People who would be just as confused, lost and hurt as I was. And I knew that I could help—and I knew that I MUST help. No parent should walk the journey of child loss alone. Today, I am a cofounder of the SUDC Foundation, an organization that helps families who have lost a child. It is a place for parents to find support and resources to help them through the most unimaginable time of their lives. I am in awe daily of the people I meet. Their strength and kindness inspires me to do more. But life doesn’t simply stop there. About a year and a half after Jenna died, I gave birth to my second daughter. I realized as she grew that—as her mother—I am the one who will set the example of what one person can achieve by doing good things. I began volunteering with my local women&apos;s club, and became a Girl Scout Leader, in addition to volunteering for other local community efforts. 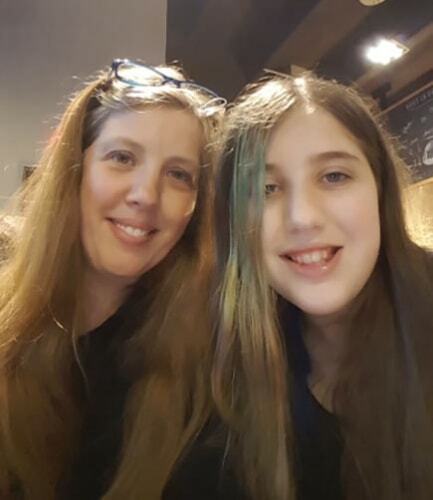 My hope is that my now thirteen year old daughter can see that if we give just an ounce of our time, and do so with kindness, that we reap rewards that cannot be wrapped in a bow. You get a lifetime of knowing you made a difference in someone’s life. My heart hasn’t forgotten the death of my daughter, and it never will. But through sadness, there is love, and it carries me as I navigate my way in life as a parent who not only has lost a child, but who also has one living and learning from me as she grows.